Atlanta, GA — S.N.A.C. it up! CEO/Chef, Shiona “Shi” Curry authors S.N.A.C. it up! Cookbook: Shi’s Natural Approach to Cooking (www.snacitup.com) to inspire children to make healthy food choices. Shi’s passion for eating healthy ultimately translated into an aspiration for all children to be healthy, while enjoying food that tastes great. Shi credits her parents’ desire in supplying her siblings and herself with a diet of natural foods, even though she was initially hesitant. However, after adopting positive affirmations into her life, Shi found it easier to make healthy food choices. After making a conscious decision to eat healthy, Shi also began exploring her love for cooking, which stemmed from her fascination as a four-year-old when she would watch cooking shows, and read every cookbook she could get her hands on. 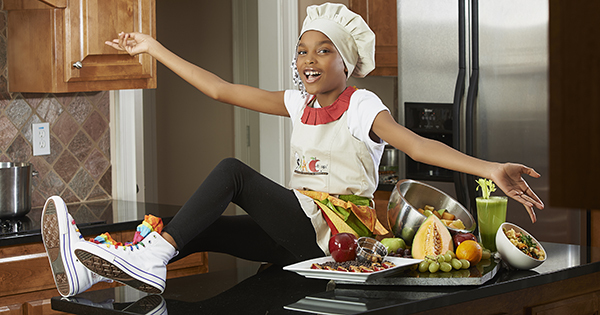 Shi, with the guidance of her supportive parents, began transforming natural foods that are usually considered unappealing to children, such as brussel sprouts and broccoli, and made them “SNACalicious.” Shi then decided to create a platform to educate children on the benefits of eating healthy and thinking good thoughts, i.e. “affirmations,” while remarkably encouraging her peers to take charge of their lives at a young age. In the S.N.A.C. it up! Cookbook, Shi uses all natural ingredients and spices, and creates delicious gourmet dishes that are easily reproduced, and as such is a great guide to keep children engaged in taking control of their overall health. Shi also conducts a number of workshops and seminars to engage children with the message of healthy eating and thinking, while highlighting the correlation with childhood obesity and diabetes. Program titles include: “Think Inside the Lunchbox,” “S.H.A.R.E.W.I.T.H.,” “Sweet Life on S.N.A.C,” and “Toby’s War on S.N.A.C. !” All programs, including the S.N.A.C. it up! School DVD Curriculum, which are designed to address different aspects of health. To learn more about S.N.A.C. it up!, visit www.snacitup.com for further information.